Costumes with “crazy” in their name are perfect for Halloween. The outfit is often an eye-catching hodgepodge of items, and you have a perfect excuse to act ig’nant all night long. The Crazy Cat Lady is no exception. The outfit is totally open to interpretation so you can wear any wonky old clothing of your choosing. Layers, anything extremely retro, brightly colored, mismatched, or a bit tattered and/or stained is perfect. Accessories like big hats, big purses (for toting more cats), long scarves, garish and smeared makeup, and hair curlers will show everyone that you are indeed more concerned with herding all your pretty kitties than with looking in a mirror or knowing what month it is. Because of the anything-goes nature of this outfit, it’s fast and easy to create, and makes a creative last minute costume idea. The Crazy Cat Lady costume offers some extra flexibility, too. Maybe you don’t exactly want to focus on the crazy part, and want to instead just show your greater-than-average love of cats. 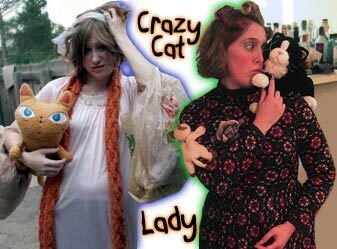 Here’s a garden variety Crazy Cat Lady that’s just crazy for cats, not loco crazy. Just find any item of clothing with a cat print or a picture of a cat on it and build from there. No matter which version you opt for, be sure to attach several stuffed cats to your outfit, in your hair, and in your purse. If you’ve got kids or are a Crazy Cat Lady in real life, you should have these lying around. Did you find this Halloween tutorial useful? If you’ve made your own version of this costume, we would love to see pictures! If your pics are already online, post a link in the comments below, or send us an e-mail so others can be inspired as well. 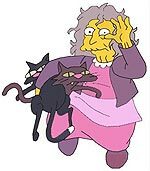 Subscribe to comments with RSS or TrackBack to 'Costume Idea: Crazy Cat Lady Costume'. I’ve had this idea for a couple of weeks (thanks to a friend). Thank you so much for the great ideas to make it mine!!! This is such a good idea. I love it. Thanks for the post.